If your garage is due for an improvement, look no further than Custom Garage Works! 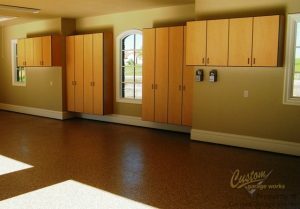 Known for our professional garage floor coating in Rhome, TX, we first started our business in 2003. While we were unable to locate the services we wanted inside of the industry, we did not let that stop us, but instead, we made the decision to join the industry ourselves. Presently speaking, we are proud to provide our clients with some of the best garage storage solutions on the market, along with floor coatings that are stronger and more durable than traditional epoxy. Our contractors are professional trained, and we are passionate about creating custom garages, with superior garage floor coating results across DFW. 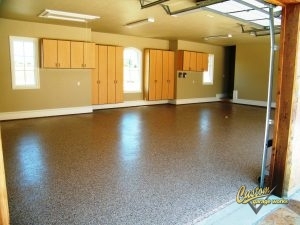 Our premium garage floor coating in Rhome, TX is one of our most common garage options! This is because by using polyaspartic coatings instead of epoxy, we get a finish that lasts longer and performs better. Thanks to the tough composition, our polyurea-based floor coating is resistant to yellowing and flaking that can occur with epoxy. And thanks to our use of a diamond grinder instead of harmful acid etching for floor preparation, we can ensure a greater amount of adhesion, which leads to a better installation. If you’re interested in hearing more about our garage floor coating service, you can schedule your free estimate when you call 214-494-9068 or 817-308-1305. Garage Floor Grinding Our diamond grinding technique will help you get the optimum surface to apply your floor coating to. And More! If you’d like to learn more about the services we offer, you can look at them here! When you are running out of space in your garage, Custom Garage Works has the right garage storage and organization solution for your home! Your garage looks greatest when it is tidy and organized. We provide a variety of solutions to sort your belongings, including overhead storage racks and garage cabinets. Unlike other companies, our storage racks are designed for heavy duty weights, and our storage cabinets are designed specifically for use in garages. When you need a reliable garage floor coating in Rhome, TX, and unmatched organization solutions, you can depend on Custom Garage Works. Overhead Storage Racks When you need to get more out of your overhead storage space, our durable storage racks are a fantastic place to begin! Storage Cabinets Unlike traditional cabinets, these are made specifically to help you get more from your garage storage! Car Lifts Are you running out of space for your cars? Our garage auto lifts can help! And More! We provide a extensive selection of garage organization resolutions to our clients, to provide the optimal custom garage!